Janaya Khan, known as Future in the Black Lives Matter movement, is a black, queer, gender-nonconforming activist, staunch Afrofuturist, social-justice educator and boxer based in Toronto. As the co-founder of Black Lives Matter Toronto, they are committed to black liberation, transformative justice and indigenous sovereignty and operate through a black transfeminist lens. They have previously been featured in the Feminist Wire and RaceBaitR and can be found shutting it down at an action near you. Geographical, ideological and cultural ‘fringes’ having shaped much of the twenty-first century’s speculative imaginary and its imagery. Philosophy, art and design have experienced a bursting open of ontological parameters and a surge towards hybridized methodologies. The digitized space of the Internet, which has powerfully influenced these trends is also considered to be a space without border or periphery, where the ‘fringe,’ practices and ideologies of the analog world are able to blossom. This panel looks at such peripheral philosophies and art forms: flickering post-human ontologies, new-media sound art, and tomb design. Social media provides many tools for constructing digitized yet fully formed online selves. With an influx of self-photographing, self-documenting and self-surveillence technologies, to what extent are our digital avatars both genuine and constructed? How are these identities formed and what are the implications of this online performativity? Responding to questions of age, gender, privacy and beauty through examining artists such as Petra Collins, YouTube make-up tutorials and the discursive trend towards ‘self care,’ this panel looks at how these new considerations of the ‘self’ are affecting visual culture. As communication via devices becomes ubiquitous, the notion that ‘words are sacred’ is increasingly both a cliché and an untruth. This panel is designed to trouble this notion through interrogating the influence of new media on writing and speaking. With a publishing industry in upheaval, as well as online dissemination of philosophy and viral sharing, writing can be metareflective of these shifts. Words, and our ability to choose the right ones, are extremely important to us when expressing and asserting ourselves in moments of both marginalization and empowerment. News spreads rapidly and in myriad forms of new media: Twitter, Facebook, Instagram and blogs are but a few deterritorialized news sources. Additionally, these online forums have become critical sites for the proliferation and explosion of both grass roots activism and international movements. #BlackLivesMatter, #IdleNoMore, #KillBillC51 and the Syrian refugee crisis have taken shape on social media, organizing and inspiring pivotal protests amongst bodies in public spaces. Yet social media has also resulted in both corporatized activism and what has been popularly decried as ‘slacktivism’ – an online attendance to politically charged protests, marches and gartherings that is not physically carried out. This panel interrogates the digital sides of activism, hegemony and the popular media responding to it: surveillance technologies, television and hashtags. 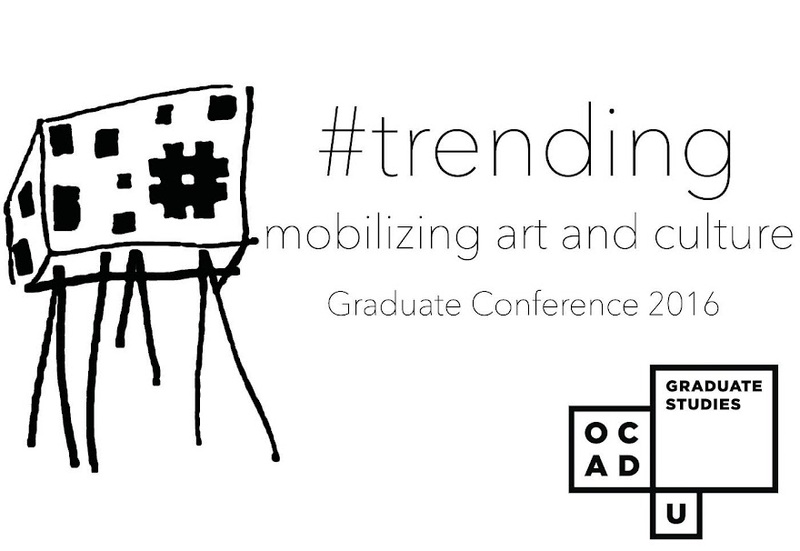 The 2016 CADN Graduate Conference at OCAD U is dedicated to the perspectives of emerging scholars. The interdisciplinary all-ages conference will promote an open space for dialogue about the art historical, socio-cultural and political trends of the contemporary moment. We hope to foster a welcoming atmosphere that takes into account accessibility, privilege and sustainability thereby encouraging not only inventive and radical conversations during the conference but future collaborations continuing the trend of giving voice to new and exciting ideas.